After two weeks of camping in the 110 degree heat of the Nubian and Bayuda Deserts, it is easy to see how so many powerful armies perished trying to conquer all of Nubia. There are also the 3,000 year old tombs that still hold original colors and the untouched ruins of ancient temples and pyramids, some of which sit amazingly in people’s backyards. We are overjoyed with the exclusivity of exploring without the hoards of vacationers and hassling vendors that plague the more popular sites of neighboring Egypt. But far above everything in Sudan, we have fallen in love with the unprecedented hospitality of the Sudanese people. We imagine what it would be like if a group of Sudanese came walking through our yard and we halt everything to insist that they come in and spend the afternoon drinking tea with our families. There is a pang of sorrow with the realization that this is not a part of American culture. With that said, we cross into Ethiopia ready to start a new chapter in our journey. After very little red tape and no police checkpoint at the border town of Metema we are in Ethiopia, home of the Ark of the Covenant, the source of the Blue Nile, and arguably the cradle of humankind. The official language spoken in Ethiopia is Amharic and it has its own unique script, with over 200 characters that denote syllables rather than letters. The traditional food here is injera, a large spongy pancake that is used to scoop stew, meat and vegetables by hand from a shared plate. At the border we enjoy a quick lesson as we learn some important Amharic words like ‘hello,’ ‘goodbye,’ ‘diesel,’ ‘thank you,’ ‘water,’ and a few numbers. Immediately noticeable in speaking with the Ethiopians is a quick inhalation of air used in a similar fashion to our use of ‘uh-huh’ in conversation. After the brief introduction to the Ethiopian culture we start climbing towards Gondar and the southwestern edge of the Simian Mountains, one of Africa’s largest ranges and home of Ras Dashen, the highest peak in Ethiopia (4620 meters). Unlike Sudan, there are people and animals everywhere along the road. We are told by a pair of Brazilian travelers at the border that the three things to watch out for in the road are cows, donkeys, and children. It is soon apparent that the children have the most sense of the three when a car is approaching. Donkeys don’t care about anything, goats and sheep are erratic, and cows just cross with the masses. One thing is clear: the reason why it is a big no-no in every overland book to travel at night is because of the animals. After seeing Lake Tana and a small, pre-rainy season Blue Nile Falls, we head south to the magnificent Blue Nile Gorge. The beauty of the drive can only be experienced fully over the 30 km stretch of road that drops from 2,500 meters to 1,200 meters and then back up the other side after crossing a small bridge over the Nile. We pay the price for the beautiful drive as the climb exposes some car issues that the level terrain of Sudan couldn’t. Despite what other overlanders have told us, the yells of “Faranji! Faranji!” are not accompanied by hurled rocks. Perhaps we smile and wave before they can take any such action, or it is simply a case of an exaggerated tale…or maybe we are just lucky. In any case, our experience with northern Ethiopians is very pleasant. After a few hundred miles of spectacular scenery (and a little car trouble), we descend upon the city that is the home of Lucy, the most famous 3.5 million year old skeleton, who was found in 1974. Even though she’s not the oldest remains ever unearthed, her notoriety is enough that we cannot see her at any point during our visit to Addis Ababa. And this may be the most disappointing thing about the entire trip thus far. No joke, she is currently on tour visiting none other than the United States of America. It is difficult to imagine that a nation of such beauty is also one of the worlds poorest. The Prime Minister’s Palace, about half a mile up the hill from the President’s, overlooks the hills of Addis Ababa and the entrance gates of the immaculate Sheraton sit amid the shanties, making it seem like more of a monstrosity than an oasis. We take advantage of the fast Internet there, but we prefer the atmosphere of our little hostel in the Bole Road area on the other side of the city. 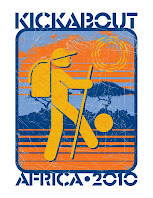 Before the arrival of our final Kickabout Africa 2010 team member, ‘Brain,’ we have two project sites to visit. We are spending three days with the orphans and street children of Addis Ababa through the programs of Right To Play and Sport - The Bridge. * Of course the date explanation is saved for last as a special treat for those who have stuck out this diatribe. In 1582 when the Christian world dropped the Julian calendar for the Gregorian calendar, Ethiopia did not. So Ethiopia remains seven years and eight months behind what most of the world has come to see as the correct date. They have a 13-month calendar that begins on September 11th. What we find a little easier to wrap our heads around is the Ethiopian time. Their 24-hour clock starts at our 6am, which coincides sometime around sunrise. For the areas around the equator where the sunrise and sunset do not have a variable nature according to time of year, it is brilliant to begin the day with the sunrise. 2 comments: on "11th of Megabit (the 7th month), 2002 *"